Xinjiang is the largest political subdivision of China— it accounts for more than one sixth of China's total territory and a quarter of its boundary length. Xinjiang is mostly covered with uninhabitable deserts and dry grasslands, with dotted oases at the foot of Tian Shan, Kunlun Mountains, and Altai Mountains. The inhabitable oasis accounts for 9.7% of Xinjiang's total area by 2015. 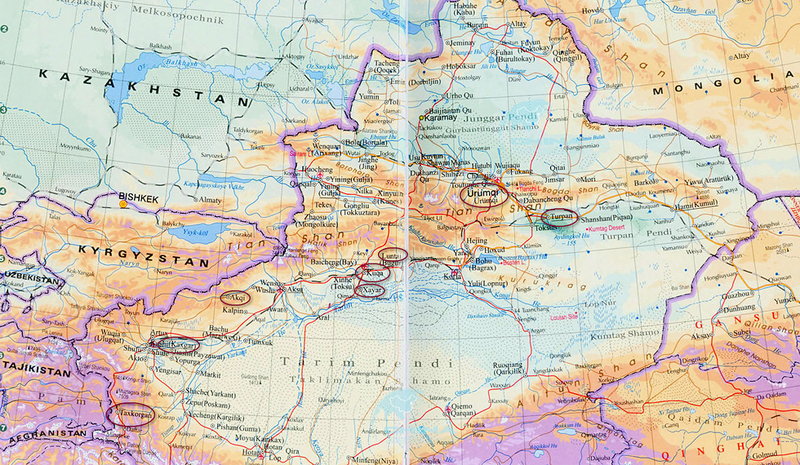 The places we are going to visit are Southwest of Urumqi (except Turpan). Pomegranates: Pomegranates are in season in the late summer and fall months. You'll find them piled up outside markets and are sold by the kilo. Naan Flatbread: These flat breads are on sale throughout the region by small bread makers. Best bought warm, straight from the naan oven, they are a breakfast staple. Some are baked plain but you can also find some baked with cumin, salt, scallions or sesame seeds baked in. The breads are often decorated with traditional round circles. Leghman Noodles: The Xinjiang version of “lamian” is called leghman. Traditionally hand-pulled, they are first boiled and then topped with a stir-fry of different ingredients, depending on where you have them. Usually the topping is a mix of vegetables and we ate them with mixes of tomatoes, peppers, onions, potatoes and beans. They are not served in a soup, but rather cooked and topped with the vegetable mix. Polu Rice Pilaf: Another very typical dish that you’ll find being sold often outside restaurants from an enormous wok-type dish is Xinjiang’s polu, or rice pilaf. This dish is made from cooked mutton along with onion and yellow carrots – a type of carrot I’ve only come across in Xinjiang. The meat and vegetables are cooked with some spices, including cumin, and then steamed along with the rice. Lamb and Mutton Skewers: Kawaplar are piled up on tables at every market. These skewers of mostly mutton meat and mutton fat are a staple in Xinjiang. Outside of the market there will be a line of men selling grilled skewers from small stalls. Each little stall will have a table, a pile of pre-grilled skewers and an enormous electric fan that blows the billowing smoke from the charcoal grill away and into your face if you're not careful. The skewers are typically sprinkled with a mix of spices that includes some cumin and hot chili flakes. Pantomime that you don't want the spices if you don't like chili. Raisins: Xinjiang is very famous for its bounty of fruit. It is the top producer of grapes and grape products, including raisins. You'll find all kinds of varieties in the markets and every market will have a whole section of sellers of dried raisins. Raisins are a good souvenir to bring back to friends and family. Samsa Mutton Dumplings: One of delicious foods in Xinjiang are street-side samsa. Baked in an oven similar to a naan-oven, these dumplings had a delicious mutton and onion filling. Nuts and Dried Fruits: Another thing you'll find in all the markets - as well as from street vendors selling them out of carts - is a variety of dried fruit and nuts. Most will be familiar - almonds, cashews, dried apricots, and so on. Most vendors are happy for you to sample some of their produce so you can decide before you buy. Casual shoes, such as walking shoes and comfortable sneakers. Sunscreen lotion, lip balm, sun glasses, hat, gloves, and so on. Snacks, such as chocolate and protein bar. It would be better if you bring some small stationeries such as pencils, notebooks for children as gifts. Basic medicine like Advil, aspirin, antacid, Imodium, sleeping pill, etc. Please prepare the following documents before asking our travel agent to apply permit for certain area of Xinjiang. You can email me the information before we departure. 1. A copy (photo) of one page of your Passport which has your photo in it. 3. Full names, Gender, Date of Birth, and Passport number, Nationality, Occupation.